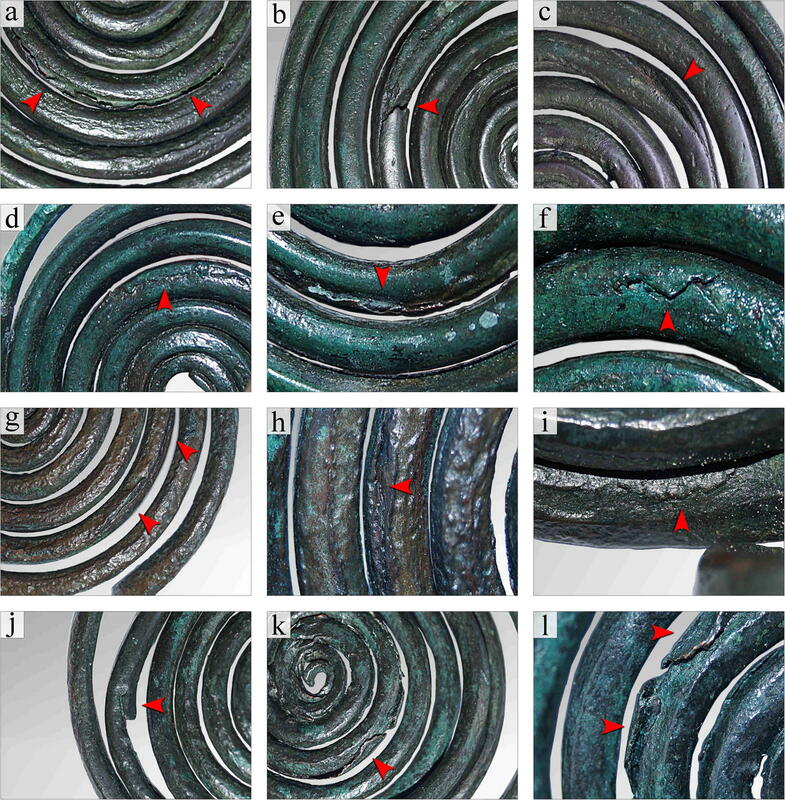 For a long time, the Eneolithic attribution of the Rudki-type double spiral ornaments was contested by a wide academic audience, and therefore, this new and extraordinary category of the copper metalwork seemed to have fallen into scientific oblivion. In this paper, we contribute to the debate about cultural attribution of the Rudki-type double spiral ornaments considering their chemical and isotope characteristics (using ED XRF and MC-ICP-MS) and the manufacturing technology (OM, X-ray, CT). Noticeably, this study represents the first documented implementation of the lead isotope analysis (LIA) for the Eneolithic metalwork from Poland. The new scientific analyses give ground to the hypothesis that the Rudki-type double spiral ornaments were produced by the Baden culture metalworker(s) who practiced somewhere in the Carpathian Basin and who have used copper ore mined in the Slovak Ore Mountains (Špania Dolina–Banská Bystrica–Kremnica mine complex). These ornaments were redistributed towards the northern ecumene of the Baden culture complex. The new owners, the Funnel Beaker (TRB) culture communities from the region of modern Poland, deposited the ornaments in hoards (Kałdus, Przeuszyn and Rudki) during the mid-4th millennium BC. The results, furthermore, indicate that the so-called Baden spiral metalwork package must be now complemented by the Rudki-type double spiral ornaments. Remarkably, this package also found an echo in pottery decoration, as documented by a narrative scene incised on an amphora from Kałdus, which could be also interpreted as one of the earliest known proofs for the wagon transport in Europe, alongside the famous ones reported from Bronocice or Flintbek. 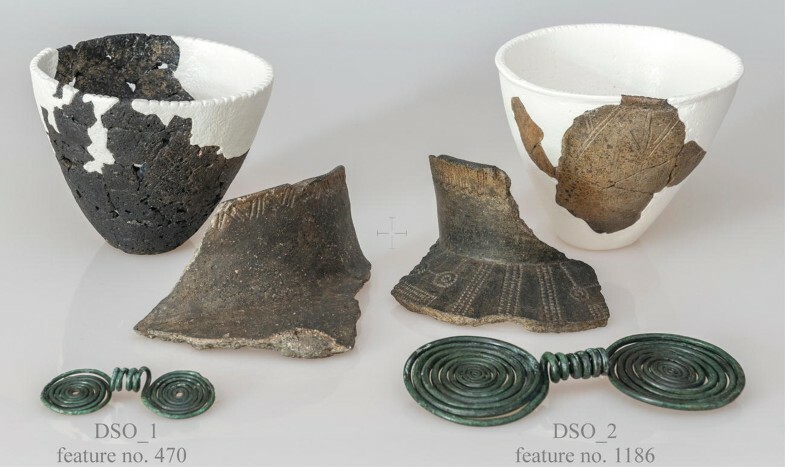 A new and extraordinary category of the copper metalwork, displaying a somewhat archaic technological pattern, appeared in a cultural landscape occupied by the communities of the Funnel Beaker (further: TRB) culture during the mid-4th millennium BC in the region of modern Poland (Fig. 1). Arranged in the form of two flat spirals joined in a tight cylindrical link at the centre, the Rudki-type double spiral ornaments (DSO) emerge as a phenomenon of the metalworking praxis shared by the communities of the Baden culture complex (Fig. 1). In terms of the proposal made by Gedl (2004, pp. 159–61, Taf. 69), such a category of metalwork may be defined as the Doppelspiralscheiben mit Spiraligem Verbindungstück. Although Gedl has himself acknowledged that the ornaments from Przeuszyn and Rudki belong to the Eneolithic, it is clear now that the typological indicators proposed by Gedl were far too general. This overgeneralisation of the typology of double spiral ornaments led to a strong conviction about their non-Eneolithic chronology. This assumption was strengthened further by the fact that many very similar objects were made in the Late Bronze Age (further: LBA) and Early Iron Age (further: EIA) (see, e.g. Gedl 2004, p. 161 with further references therein; Seger 1907, p. 33, Fig. 48; Truhelka 1895, p. 510, Fig. 1) (Fig. 2). This is particularly true for the DSOs discovered in Poland, most of which are the legacy of the Lusatian culture (Adamczak et al. 2015a, p. 205; Gedl 2004, pp. 159–61, Taf. 69; Suchy et al. 2016, p. 158). It is important to stress that the Rudki-type DSOs have not so far been reported from any pan-European Eneolithic ecumene other than those occupied by the TRB communities in the region of modern Poland (Adamczak et al. 2015a, p. 215). When discussing the current state of knowledge about the TRB metalworking praxis, the absence of any conclusive evidence supporting the introduction of copper processing by the local Eneolithic communities from the Vistula and Oder Basins is of great importance (see, e.g. Kowalski et al. 2016, p. 196). At the time of writing, eight double spiral ornaments have been reported from Poland (Fig. 3 and Table 1). They come from the hoards deposited in the areas of intensive TRB settlements. Two DSOs were found in Kałdus and three in Przeuszyn, and finally, three DSOs were discovered in Rudki (Adamczak et al. 2015a; Gedl 2004, p. 160; Kasiński 1936; Koehler 1900, p. 10, Fig. XXV; Kostrzewski 1924, p. 164; 1953, p. 179; 1962, p. 56; Lissauer 1891, p. 75; Schwartz 1881, p. 2; Szpunar 1987, pp. 16–9). The research results presented here for the Eneolithic hoards from Kałdus have contributed to the issue of a chronological placement of the Rudki-type DSO. The obtained radiocarbon results are consistent and indicate a 3502/3498–3363/3356 cal BC date range (see Table 1). Therefore, it allowed us to assign the DSOs deposited in Kałdus with the TRB-MES III phase (= 3500–3350 cal BC) which corresponds with the Boleráz period (Adamczak et al. 2015a, p. 203; Müller 2012, p. 54, Abb. 8; Müller et al. 2012). The copper flat axes of Bytyń type accompanying the DSOs from Przeuszyn and Rudki are chronologically placed in the classical and late Wiórek phases of the TRB East Group and, thus, correspond to the Boleráz and classical Baden periods. 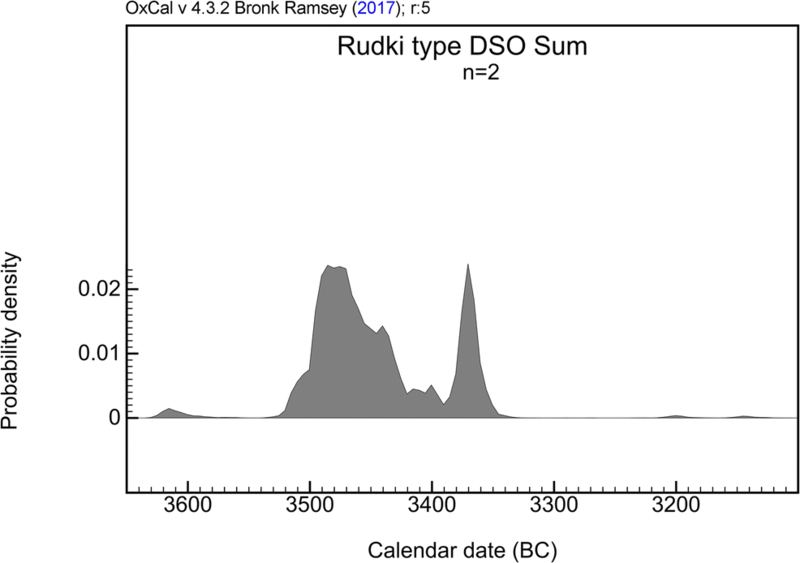 For that reason, the DSOs from Przeuszyn and Rudki can arbitrarily be placed between 3650 and 3100 cal BC (Adamczak et al. 2017, pp. 89–90; Łęczycki 2004, p. 70; Müller 2012, p. 54, Abb. 8; Müller et al. 2012; Szpunar 1987, p. 17). The main goal of this work was to deal with certain concerns about the cultural attribution and the chronological placement of the Rudki-type DSOs from Poland. For this purpose, the ornaments were examined in a thorough and comprehensive manner. A particular aim of the analyses was to establish the origin of copper metal and the manufacturing technology of these artefacts. Therefore, the spiral ornaments were analysed for their elemental compositions using ED XRF and lead isotope analyses were made using MC-ICP-MC. The results of the analyses provided ground for the construction of an archaeological model proposing the distribution channels and cultural status of the discussed ornaments. Also, the absolute chronological placement of the Rudki-type DSO was taken into consideration in this research project. The chemical compositions of the analysed objects were established by means of the energy-dispersive X-ray fluorescence (ED XRF) in the Laboratory of Historical Layers Research Centre at AGH University of Science and Technology (Poland) using a Spectro Midex spectrometer equipped with a molybdenum X-ray tube and a Si Drift Detector (SDD) with 150 eV resolution at 5.9 keV. The analytical conditions used were 44.6 kV, 5.9 mA and 180 s of live time. The ED XRF quantifications were performed with the use of the fundamental parameters program FP+ for the elemental analysis of the alloys. The errors resulting purely from X-ray tube spectral distribution can be significant and exceed even above 10% relative, and the accuracy of fundamental parameter methods is hampered when undetectable low-Z elements (e.g. C, O) are present in the sample (Sitko 2007, p. 786; Sitko and Zawisza 2012, pp. 144–5; see De Boer et al. (1993), Elam et al. (2004), Mantler and Kawahara (2004) and Sitko (2007, 2008)). Surfaces of the analysed artefacts were prepared by mechanical removal of the corrosion products (exposing the metallic core) and followed by degreasing with O=C(CH3)2 (acetone). The chemical compositions of the artefacts were determined on the basis of a series of 5 measurements taken from the metallic core. The analytical error of ED XRF for trace elements in copper is usually below 10% (Lutz and Pernicka 1996), and the detection limits for each element are given in Table 2. The ED XRF data are listed in Table 2 and plotted on Fig. 8. Five samples were collected from Kałdus (DSO_1 and 2) and Przeuszyn (DSO_3, 4 and 5) ornaments. The samples were first weighed in Savillex beakers, after which 2.5 ml HNO3 was added. The beakers were then covered with screw caps and kept closed on a hot plate at 90 °C overnight. The next day, the closed Savillex beakers were heated for 40 min at 140 °C. Then the beakers were opened and the temperature increased to 200 °C, until the liquid was evaporated to one large drop; 2 ml HClO4 was added and the beakers were closed again and heated for 1 h at 200 °C. After 1 h, the caps were removed to let the liquid evaporate at 240 °C. The beakers were swirled occasionally during this process. When only a large drop remained, the beakers were taken from the hot plate and 3 ml HF was added after cooling. The beakers were placed on the hot plate again without caps to evaporate the liquid until near dryness. Then 2.5 ml of 2.5 M HCl was added and the beakers were closed to warm up for ca. 10 min to obtain a clear solution. This was again evaporated on a hot plate at 110 °C until near dryness, after which 5 ml 1 M HNO3 was added to obtain a clear solution. This solution was used for lead isolation and isotopic analysis by MC-ICP-MS (multi-collector inductively coupled-plasma mass spectrometry). Lead isolation (procedure described by De Muynck et al. 2008) was carried out at a class 10 clean lab at Ghent University (Belgium). Pb concentrations of the solutions were determined using a Thermo Scientific Element XR sector field ICP-MS instrument (Ghent University), to calculate dilutions for MC-ICP-MS measurements; 30 μg/l Tl (NIST SRM 997) was added as an internal standard to both standards and samples for mass bias correction calculations (see, e.g. Ketterer et al. 1991; Walder et al. 1993). Pb isotope ratios were determined using a Thermo Scientific Neptune MC-ICP-MS (see De Muynck et al. (2008) for instrumental settings, procedure described by Rademakers et al. (2018a, b)). To calculate the LI ratios, a blank correction was carried out and the measured intensities for 202Hg+ were used to correct for Hg contribution to the apparent intensity for the 204Pb+ isotope. The raw sample ratios thus obtained were corrected for Tl-based mass discrimination following Russel’s law, based on replicate measurements of the NIST SRM 981 common lead standard (commonly accepted ratio values from Galer and Abouchami (1998)); 2σ uncertainties were better than ca. 0.01% for the corrected ratios to 204Pb and better than 0.005% for ratios to 206Pb (with the exception of sample SHM004, for which lead concentrations were very low: 2σ uncertainties were still good at ca. 0.02% for the corrected ratios to 204Pb and 0.006% for ratios to 206Pb). The LIA data are listed in Table 3 and plotted on Figs. 4, 5, 6 and 7. The examinations of the macrostructure of the DSOs were carried out in the Laboratory of Historical Layers Research Centre at AGH University of Science and Technology (Poland) using the Nikon SMZ 745Z stereoscopic microscope (OM) equipped with the Nikon Digital Sight DsFi1 microscope camera. The aim of these examinations was to determine the manufacturing technology of the analysed artefacts. The macrostructure analysis results are listed in Table 4 and plotted on Figs. 9 and 10. The X-ray defectoscopy was conducted in the Laboratory of Foundry Research Institute in Kraków (Poland) using an industrial X-ray radioscopy system, Y.MU2000-D (YXLON), comprising an X-ray tube (160 kV) coupled with a digital panel detector with the active area of 200 mm × 200 mm at the frame rate of 15 fps and the pixel size of 200 μm. Data imaging was performed with the use of the YXLON Image 2500/3500 system. The X-ray defectoscopy results are plotted on Fig. 11. The computer tomography (CT) examination was employed to explore the manufacturing technology of the DSO_2 from Kałdus. The CT investigations were carried out in Nicolaus Copernicus Specialist City Hospital in Toruń (Poland) using a clinical Philips Brilliance 16 Slice CT Scanner equipped with the Philips 8.0 MHU MRC X-ray tube. The artefact was positioned perpendicularly to the bore of the CT and imaged at the following parameters: 120 kV, 50 mA, 3900 ms and 0.8 mm slice thickness. The CT scans were processed further using the Philips DICOM Viewer R3.0-SP03 software. The CT results are plotted on Fig. 12. The microstructure analyses were performed in the Laboratory of Historical Layers Research Centre at AGH University of Science and Technology (Poland) using the Nikon Eclipse LV150 metallographic microscope (OM) equipped with a Nikon Digital Sight DsFi1 microscopic camera and the Nis-Elements system for a picture analysis. The OM observations were conducted in the cylindrical links exposed on the DSO_2 (Kałdus) and DSO_6 (Rudki). The microareas were polished with diamond paste (1 μm) and etched in HCl (30 ml) + FeCl3 (30 g) in C2H5OH (120 ml) solution. The microstructure analyses results are plotted on Fig. 13. 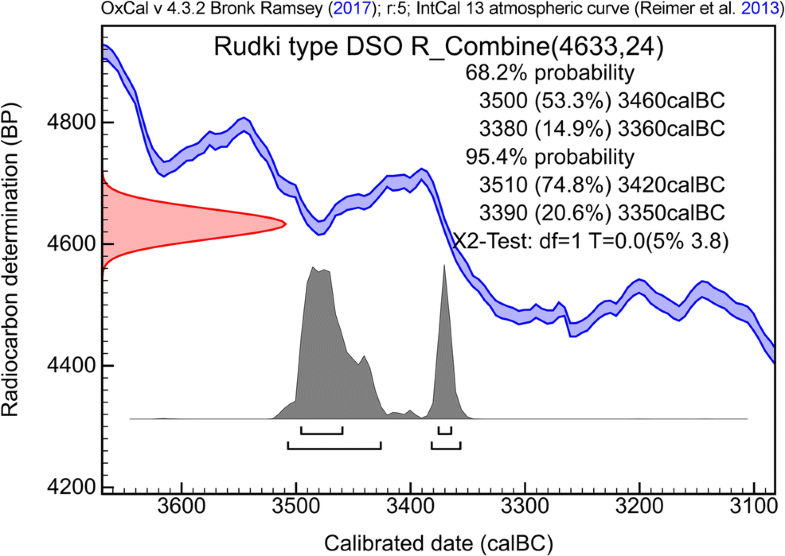 In order to narrow the probability ranges of the chronological placement of the Rudki-type DSO, radiocarbon dates were obtained for three individual bone samples collected from two features recovered from the TRB settlement in Kałdus (see Table 1). The samples were 14C-dated in the AMS 14C Laboratory of the Adam Mickiewicz University in Poznań by routine laboratory procedures for bone samples described by Goslar (2018). 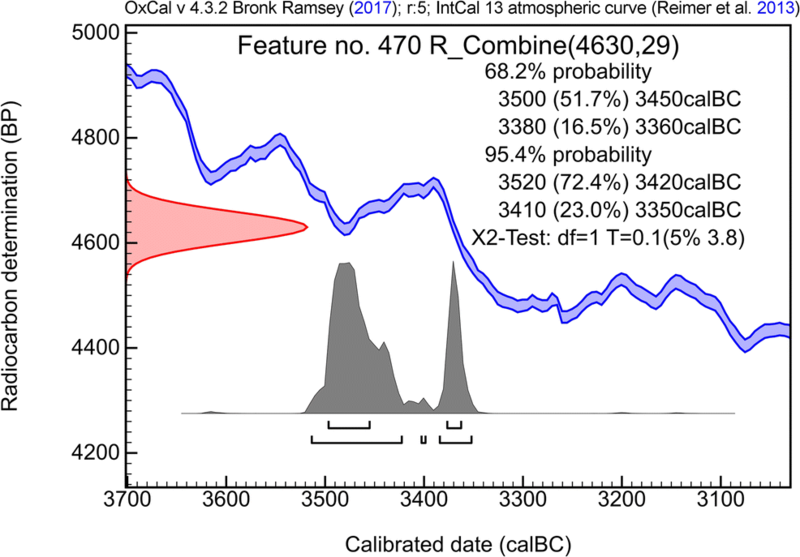 Calibration of 14C age was modelled in OxCal v. 4.2.3 (Bronk Ramsey and Lee 2013) using IntCal13 calibration curve (Reimer et al. 2013). The 14C dates processing was performed with the use of the Sum and R_Combine commands, proposed by Bronk Ramsey (2009, 2017), and completed by testing in the environment of the OxCal v. 4.3 software with IntCal13 (Reimer et al. 2013). The resulting outcome was rounded to 10 years and presented with 68.2 and 95.4% confidence intervals. The 14C data are listed in Tables 1 and 5 and plotted on Figs. 15, 16 and 17. The results of the examinations of the Rudki-type DSOs were divided into two main parts. In the first part, there is a discussion of the trace elemental compositions of the ornaments analysed using ED XRF (and comparisons with other artefacts of similar chronology) and the results of lead isotope analyses of five of double spiral ornaments. The second part is devoted to the study of the manufacturing technology (OM, X-ray, CT) of these ornaments. The ED XRF analyses show that Rudki-type DSOs are made of unrefined copper (98–99 wt% in all cases; Table 2). The iron contents measured in the ornaments are in all cases less than 0.1 wt%, which is in line with the chemical compositions reported by Junghans et al. (1974) for the Eneolithic metalwork, where the iron content is expected to remain below the value of 1 wt% (Cook and Aschenbrenner 1975, p. 253; Kadar 2002, p. 13). Cobalt, nickel, silver, antimony and bismuth are all below 0.1 wt%, while the arsenic content varies between 0.2 and 1.3 wt%. Lead content is in all case below 0.25 wt%, which is quite typical for the earliest copper artefacts found in Europe. In the double spiral ornaments from the Kałdus hoard, the lead content is higher than in the other artefacts analysed for this project, but not unusual as a natural impurity of copper ores used in the Prehistoric times. On the whole, the level of impurities in the analysed DSOs is very low, indicating copper smelted from oxidised or sulphidic ores (not from Fahlerz). With a major contribution made by arsenic, the total content of impurities averages from 0.5 to 1.7 wt% (see Table 2). The chemical compositions of the double spiral ornaments from Poland represent pure copper and correlate chemically well with clusters 1 and 2 defined by Krause (2003, pp. 90–1 and 322, Abb. 40 and 41) as ‘pure copper’ (= A:1) and ‘copper with low amounts of arsenic and nickel’ (= A:2). It can also be noted that a metal type that is characteristic of the Rudki-type DSOs closely resembles the so-called Mondsee copper (Frank and Pernicka 2012, pp. 120–4, Table 1, Figs. 5.4 and .5). The lead isotope data obtained for the five double spiral ornaments from Poland is listed in Table 3. Finding for each artefact the ore samples that have identical (within ± 0.1% of the error) all three lead isotope ratios. This is done using the TestEuclid procedure (Stos 2009, p. 168) searching through the database covering all ore data. Plotting the lead isotope ratios of the artefacts on 2-D lead isotope diagrams for at least three independent lead isotope ratios (most often they are three ratios to 204Pb, or two to 206Pb and one to 204Pb) together with the data for all ore deposits that appeared to show matching lead isotope ratios in the TestEuclid procedure. The plots allow consideration of the mutual position of groups of analysed ores from various ore deposits relative to the groups formed by LI ratios representing the archaeological artefacts. Rejection of the ore deposits that on geochemical or chronological ground could not have supplied copper for these artefacts. Comparisons with the lead isotope and elemental data for contemporary artefacts from the same region. In this case, the TestEuclid comparisons were made with the database of about 8000 sets of lead isotope data from the deposits of copper and lead/silver ores in Europe and the Near/Middle East. This test indicated that for each of the spiral ornaments analysed there are many single ore samples from various localities, for example Cyprus, Southern Spain, Massif Central in southern France, the Austrian Alps or Valais in Switzerland, that have very similar lead isotope compositions. However, the ores from these locations either do not have chemistry matching the DSOs or are from localities that are not likely to have been exploited in the 4th millennium BC.1 Further, the lead isotope plots show that the lead isotope data obtained for the DSOs from Poland plot between and on the edges of the groups of data for these ores as shown on Fig. 4. Also, the group of copper ores from the Harz Mountains in SE Germany has lead isotope ratios that are very close to the whole group of these ornaments. However, the only group of copper ores chemically and isotopically fully consistent with the analysed DSOs is found in the Slovak Ore Mountains (Fig. 5). 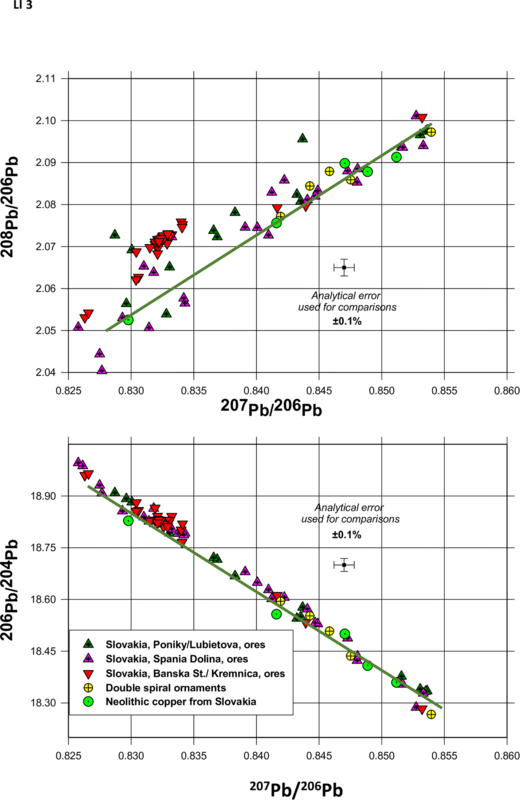 All five analysed DSOs have lead isotope ratios fully consistent with the ores from the Hron Valley mining region (= Hrontal), including Špania Dolina, Banská Štiavnica and Kremnica published by Schreiner (2007, pp. 245–51). It needs to be emphasised that these published data are obtained by two different methods of isotope analyses: data marked ‘Bri’ were taken in Bristol University using a quadrupole ICP-MS, this instrument does not allow for measurements of lead isotope ratios with overall better accuracy than 1% and the ion beams of the isotope 204Pb are too weak to be measured (The University of Texas in Austin 2017). Therefore, from the tables of data included in the Schreiner’s publication, only the MC-ICP-MS data from Mannheim marked (MA) can be used for comparisons. 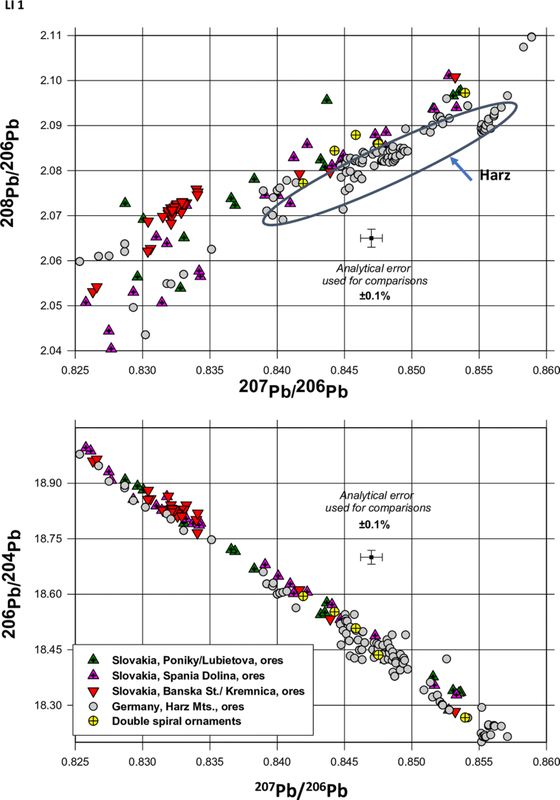 The comparative plots of the ores from the Slovak Ore Mountains and the Harz demonstrate clearly that lead isotope ratios to 206Pb for the samples of ores from the Harz Mountains plot in line below the ores from the Slovak deposits (Fig. 5). This is not surprising, because the chronology of exploitation of the copper ores in the Harz Mountains does not include the Eneolithic mining, but Schreiner (2007) indicates very early copper mining in the Slovak Hrontal mines. This statement is reasserted by O’Brien (2015, pp. 186–7). Schreiner analysed for their lead isotope compositions six copper-based artefacts from Slovakia dated to the Neolithic period (= Ludanice horizon2). They include two spirals and a four-sided awl from Čertova cave near Radošina (SAM 17677, 78 and 9), an armband from Komjatice (SAM 22326) and a casting piece from Nitriansky Hrádok (SAM 10980) (Schreiner 2007, pp. 221 and 251). The lead isotope ratios to 204Pb published for these artefacts are compared on Fig. 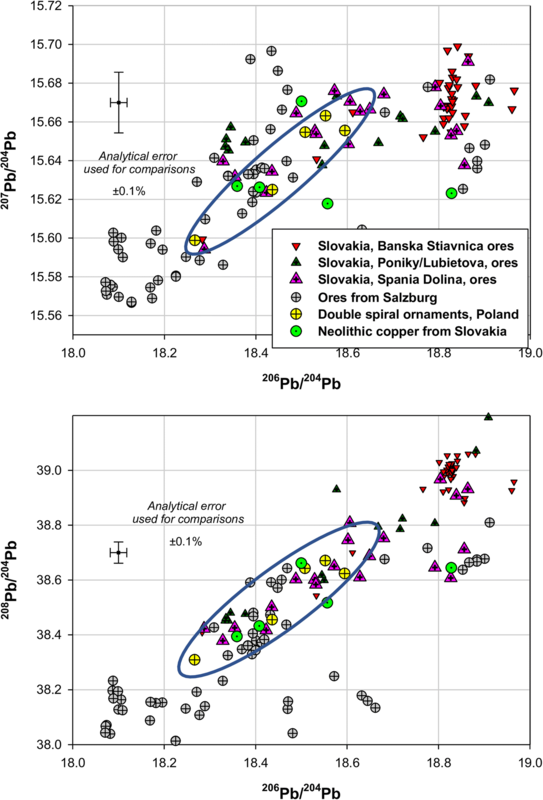 6 (presenting sets of lead isotope ratios to non-radiogenic 204Pb), together with the data for the ores from the Slovak Ore Mountains in Hron Valley and the double spiral ornaments from Poland. This plot demonstrates total consistency of all these Neolithic/Eneolithic artefacts with the ores from Špania Dolina and Poniky/L’ubietová. On the same plot, included are some ores from the Austrian Alps in the region of Salzburg, that also have similar lead isotope ratios. However, these ores are either lead ores (galenas) or Fahlores with high concentrations of silver and antimony. Neither of these minerals could have provided raw material for smelting copper ores of high purity as found in the analysed DSOs, or the copper artefacts from Slovakia. Further comparisons of the lead isotope ratios for these copper artefacts and the ores from Slovakia using the ratios to the radiogenic isotope 206Pb (Fig. 7) show very good linearity (within the analytical error) of all these data which is a further argument towards the conclusion that copper used for these early ornaments originated in the Slovak Ore Mountains. The chemistry of the analysed double spiral ornaments is broadly similar to the Slovak copper spirals. Their analyses indicate that they were made from very pure copper (Schreiner 2007, p. 232). The double spiral ornaments found in Poland have higher contents of arsenic, which means that the Slovak and Polish artefacts were not made from the same batch of minerals. Schreiner (2007, p. 40) describes the mineralogy of the ores in Hron Valley as a mixture of sulphides and oxidised ores. It is possible that the earliest copper metallurgy in this region was utilising the rich oxidised ores with varied contents of arsenic. Smelting of such ores does not require roasting; therefore, the amount of arsenic in the smelted metal can vary depending on its content in the ore, as explained by Frank and Pernicka (2012, pp. 122–4). In his publication, Schreiner (2007, pp. 230–1) divided the ores into eight clusters according to their chemistry. The Neolithic/Eneolithic copper artefacts from Slovakia in his study correlate chemically very well with cluster 5 (Fig. 8), which represents very pure copper ores from Kremnica, L’ubietová, Špania Dolina and others. Clusters 2 and 7, which include ores higher in arsenic, but comparatively low in other elements, also consist of ore samples from Špania Dolina, L’ubietová and Poniky (amongst others). It is clear from this clustering, that in each of the sites in Hron Valley, there are ores of different chemistry. Consequently, depending on the batch of ores collected for smelting, the chemical compositions of the smelted ores can vary. 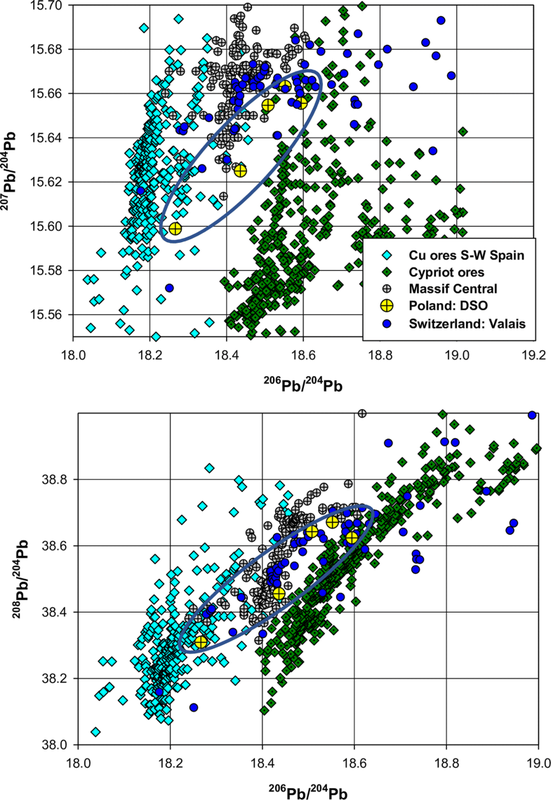 The lead isotope ratios of the Polish and Slovak copper artefacts indicate that both sets are consistent with copper ores from Hron Valley but their chemistry indicates that the copper for each of these two groups was obtained from different batches of oxides, not tetrahedrites (non-Fahlerz), possibly originating not from one mine, but collected widely from the region. On the lead isotope plot of the ores from Hron Valley and the Neolithic/Eneolithic artefacts from Poland and Slovakia, the green line indicates such mixing between the ores from Špania Dolina and Poniky/L’ubietová. 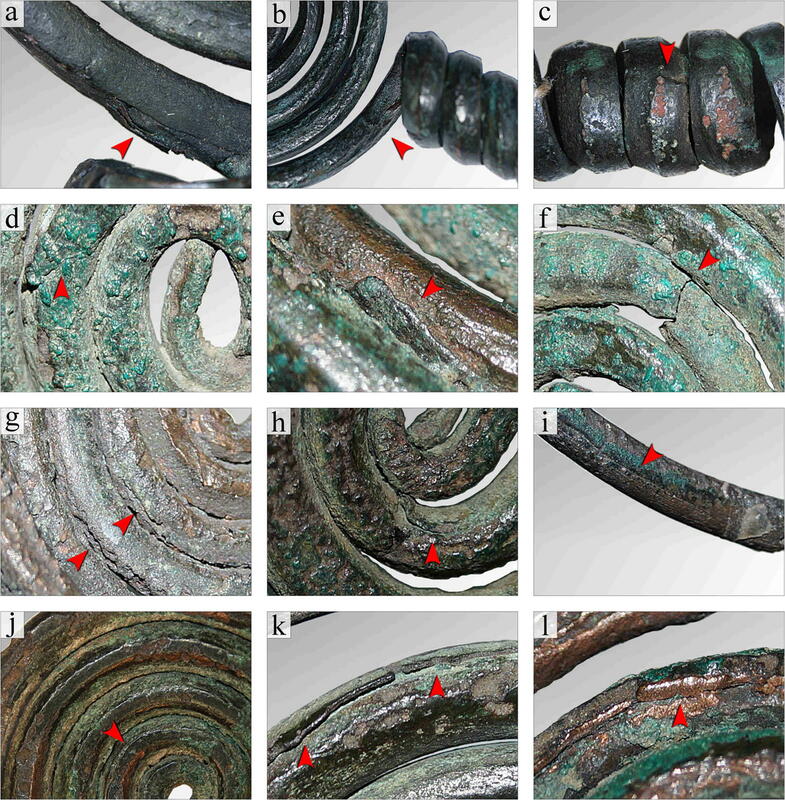 The analysed artefacts were designed to have very similar shape and dimensions which is clearly visible in the number of turns forming the flat spirals and a type of cylindrical linkage (Table 4). The number of turnings ranges from 7 to 9 and from 4 to 6, and it seems that this is a standard for the analysed artefacts. It is important to mention that neither a pin, nor any remains of a spring, or a catch plate was found on the surfaces of these ornaments. The macroscopic observations (OM) showed that joint areas are present on the turns forming the flat spirals. The joints are in the form of thin-shaped edges overlapping the central part of the rod (see, e.g. Figs. 9a, l and 10a, k, l), indicating that the Eneolithic metalworker could have employed the cramped joint for combining the individual copper rods into one part, before he or she proceeded to coil the resulting rod. The results provided by the X-ray defectoscopy (Fig. 11) and CT imaging (Fig. 12) lend unequivocal support to this conclusion. Plastic working of the starting material, i.e. shaping and elongating the individual copper rods (possibly rod-shaped copper ingots). Mechanical combining of the individual rods into a long rod with the use of a cramped joint. Forming the cylindrical linkage and the flat spirals respectively by coiling the long rod. Hammering the spirals into place to tighten the coils. This procedure affected also the shape of the rod making its cross-section nearly hexagonal (see, e.g. Figs. 9c, g and 10j). It is likely that stabilising (wooden?) blocks needed to be employed during this stage to keep the spirals in place. Rubbing with a polishing stone, to obtain a smooth and shiny surface of the final product (see, e.g. Figs. 9c, d and 10i, k). The results of the microstructure analysis (OM) made a significant contribution to the above conclusions. In the microstructure of the DSO_2 and DSO_6, recrystallised and twinned grains with strain lines are absent and straight twin lines locked in the grains are noticeable (Fig. 13). The presence of the twinned grains (Fig. 13c) suggests that the copper rod might have been re-forged hot, or, which is more probable, was cold-worked and annealed (Kienlin 2011, p. 134; Scott 1991, pp. 7–8). Further proof of this process comes from the step-like microstructures which are evident in the microarea of the DSO_6 (Fig. 13f). Particularly, this technological scenario is relevant to the stage of forming a cramped joint because the metalworker had to find a way of mechanical combining individual copper ingots into one part and to ensure durability and strength of such connection. 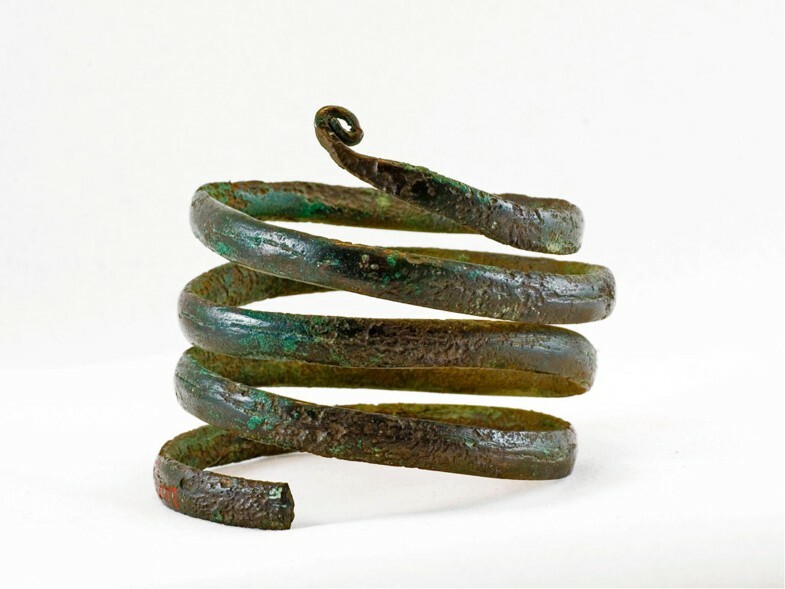 It is not certain whether a cramped joint is the hallmark of the Eneolithic spiral metalwork, though there are many copper findings that provide such justification: for example, the spiral armbands deposited in the Rudki hoard also show the cramped joints (Fig. 14). A 74.9% likelihood scenario provided by the results of the 95.4% probability distributions shows two possible dates for the depositions of the DSOs in Kałdus: one that the DSOs have been deposited in Kałdus between 3510 and 3420 cal BC (Fig. 17); the other also possible is 3390–3350 cal BC date range (see Fig. 17). Nonetheless, a radiocarbon result of 3510–3350 cal BC from Kałdus is still a very precise result for the chronological placement of the Rudki-type DSO (see Scott et al. (2007) for ‘accurate’ vs. ‘precise’). However, a different model, involving a long-term metal(work) circulation, and thus extending social life of a metal(work) is also possible (see, e.g. Kowalski et al. 2016, 2017), but rather not applicable to the analysed ornaments, because in the pre-Baden there was no double spiral ornament tradition and no double spiral ornament images incised on the ceramic vessel. Also, the Rudki-type DSOs are technologically coherent and it is likely that a cramped joint is the hallmark of the Baden spiral metalwork. Why, then, a cramped joint has not been recognised in the earlier (pre-Baden) metalwork? The results of metallographic investigations (see “Trace elemental characterisation”, “Interpretation of the lead isotope analyses” and “Manufacturing technology” sections) may be used to indicate that the inflow of the double spiral ornaments into the TRB milieu in the region of modern Poland bears the hallmark of a metallurgical horizon, and this conclusion is also supported by the settlement pattern and style of pottery. A wide range of 3650–3100 BC is commonly used by an archaeologist in Poland to date the Baden copper metalwork (linked to the TRB) which cannot be 14C dated (see, e.g. Adamczak et al. 2015a; see “Archaeological background” section), but in the case of DSOs from Przeuszyn and Rudki hoards, it seems now justified to change their chronological placement to 3510–3350 cal BC, as defined by the metal finds from Kałdus. The spatial distribution of the double spiral ornaments discussed in this paper can support the hypothesis that perhaps they could have been made in a workshop(s) inside the Vistula and Oder basins. However, this stands in sharp contrast with the fact that there is little, if any, archaeological evidence proving that copper working was indeed introduced by the local TRB communities in this region in the 4th millennium BC (see, e.g. Kowalski et al. 2016). Also, the apparent contradiction between the distribution pattern and the absence of the Rudki-type DSOs in the Carpathian Basin should not be used here as an argumentum ex silentio providing direct evidence supporting their local TRB origin. From these assumptions emerges a most convincing scenario that the analysed ornaments were made in the Baden culture workshop(s) somewhere in the Carpathian Basin, from which they were later redistributed towards the northern peripheries of the Baden complex (Fig. 18). It seems plausible that circulation of the Eneolithic metalwork which overlapped the TRB ecumenes in the region of modern Poland was strongly allied with exchange routes established already during the TRB-MES I (= 4100–3800 cal BC; Adamczak et al. 2015b; Kowalski et al. 2016). Most likely, this was done via the routes maintained during the Hunyadihalom–Lažňany horizon (Wilk 2016, p. 20, Fig. 10). This trading route linking the areas of eastern Slovakia with western parts of Lesser Poland along the Hornád–Poprad–Dunajec–Vistula axis5 (Zastawny and Horváthová 2017, p. 251), and running through Vistula Basin towards the northern ecumene of the TRB possibly became an important part of metal trading network during the Baden period in Poland. It is puzzling why the Silesian and Kuyavian centres are missing from the Rudki-type DSO distribution network, since these regions had a leading role in spreading the Baden culture towards the northern ecumene of the TRB (Bukowska-Gedigowa 1975; Zastawny 2015a, b; Przybył 2009, pp. 123–29; Adamczak et al. 2015a, p. 215). 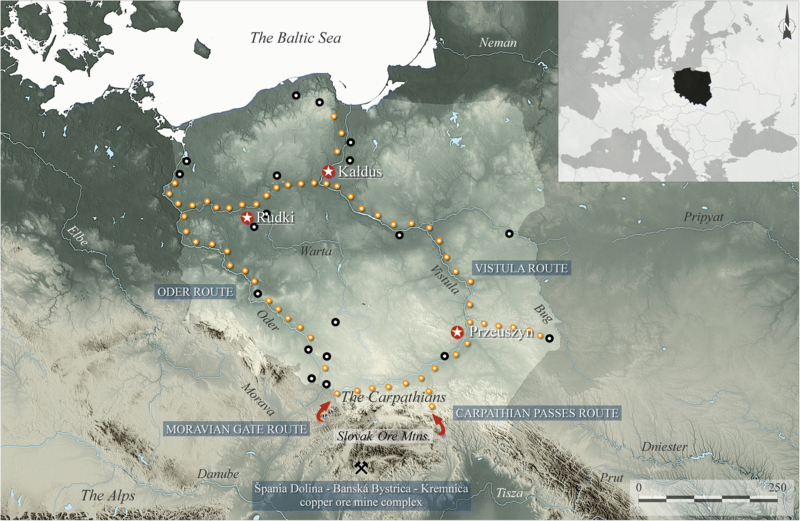 The absence of these artefacts can partly be understood in terms of promoting by the southern Baden communities the Vistula route and the Carpathian passes (alongside the Oder route and Moravian Gate route) as distributive channels for metal flow (including the DSOs). 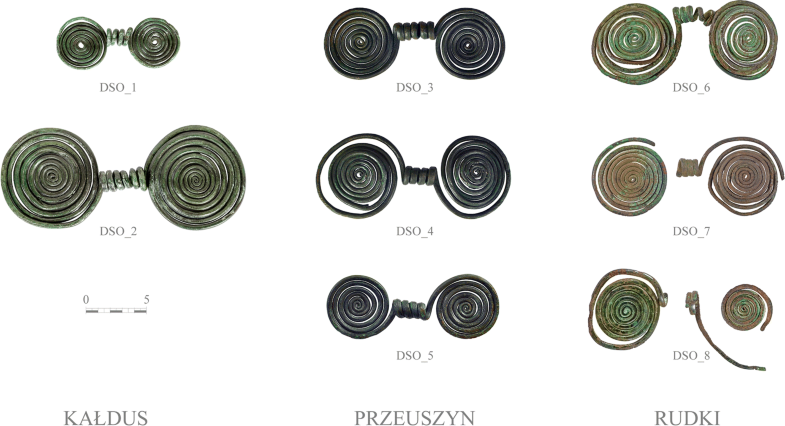 Perhaps, it would be reasonable to expect that the double spiral ornaments first appeared in the TRB communities from the Sandomierz Upland (Przeuszyn) and from there were further redistributed (and perhaps also socially reinterpreted) to their northern kinsmen from the region of Chełmno (Kałdus) and Greater Poland (Rudki). This hypothesis may be supported by the flint trading route (in particular the axes and retouched blades made from Świeciechów and striped flint) running from the mines in the eastern part of Lesser Poland towards the northern ecumene of the TRB (see, e.g. Balcer 1988; Sulimirski 1960). It needs to be stressed that the hoards from Kałdus, Przeuszyn and Rudki were incorporated in the cultural landscape established by the TRB communities near the local leading settlement centres. This is supported also by the famous Eneolithic hoard from Bytyń (with two copper yoked-ox figures) and a flat copper axe from Pamiątkowo that were found near Rudki (Pieczyński 1985; Wierzbicki 2013, pp. 196 and 242). The configuration of the votive offerings found in the Kałdus hoards adds essential information to the insights into the hoarding pattern of the Rudki-type DSO. The DSO_2 was recovered from the ceremonial pit no. 1186 near the northern corner of a pole construction (Adamczak et al. 2015a, pp. 201–3 and 213–4, Fig. 3), and it is important to recall that the TRB copper hoard found in Kietrz (southern Poland) was deposited in the corner of a domestic building (Łęczycki 1982, p. 215; 2004, pp. 60–2). There are, therefore, some indications that pit no. 1186 could be intended to serve as a foundation deposit for a ceremonial house. The supporting evidence comes from the arrangement of the remaining features found within the remains of the pole construction and the range of the offerings deposited there. If the concept of a ceremonial house is accepted, a conclusion that the place where DSOs were found could have had a significant impact on stimulating the cooperative ideology within the TRB community in Kałdus seems credible. Also, this might reflect an institutional role of the copper metalwork in the TRB social praxis (see Müller (2012, 2013) for opinion about the impact of copper metalwork on a cooperative mode of organisation in the northern TRB). One of the distinctive features of the Eneolithic hoards from Kałdus is the votive offering package indicating a hoarding pattern which involved depositing the Rudki-type DSOs together with a neck fragment of the beheaded amphora and a small comb-band-decorated beaker (Fig. 19). The neck fragment of the beheaded amphora from pit no. 1186 in Kałdus may be of importance in the discussion about the contextual significance of the Rudki-type DSO. The basic premise here is the presence of the narrative scene incised on a shoulder of the discussed potsherd, which appears to be decorated with a motif in which two spirals are joined together with a cylindrical link at the centre and suspended by two strings (?) to the base of the neck. Such a motif is repeated four times in the reverse manner. Remarkably, the narrative scene from Kałdus may, in fact, represent a model of a wagon (Fig. 20), referring to, e.g. the ceramic four-wheel wagons from Szigetszentmárton or Budakalász (Hungary) which are dated to the classical Baden period (= 3300–3100 cal BC; Anthony 2007, pp. 68–9, Fig. 4.3; Bondár and Raczky 2009, pp. 98–9, Pl. 79). Interestingly, the majority of the wagon models linked to the Boleráz tradition (= 3500–3350 cal BC) have a wagon box with a straight floor without any indication of axles or wheels, such as the one discovered in Radošina (Slovakia). In this context, the similarity of the representation of a wagon from Kałdus to a classic Baden ceramic wagon model may appear as a contradiction between the resulting radiocarbon date (= 3502–3363 cal BC) and the manner in which the axles and the wheels could possibly be portrayed on the amphora from Kałdus (Bondár 2012a, p. 78; 2012b, pp. 43–8). It is worth to recall that one of the earliest known wagon images preserved on the famous TRB vessel from Bronocice (Poland) is dated to 3635–3370 cal BC (with a 68.2% probability) (Bakker et al. 1999). Relying on a radiocarbon result of 3420–3385 cal BC (with a 68.2% probability) from the wagon track remains discovered in Flintbek (Germany) (Mischka 2011, 2013), a 3502–3363 cal BC date range (with a 68.2% probability) obtained for the ceremonial pit no. 1186 (see Tables 1 and 5) may justify placing the narrative scene from Kałdus amongst the earliest proofs for wheeled transport in the Eneolithic Europe (c.f. Anthony 2007, pp. 65–72; Bondár 2012b). The importance of the motif incised on the amphora from Kałdus relies not only in the fact that it may represent a model of a wagon, but also in a possibility that it could have been inspired by the shape of the double spiral ornament. This, in turn, may offer a hint about the possible wearing style of the Rudki-type DSO, suggesting the use as a pectoral ornament. Such a scenario becomes more reliable if one accepts that an amphora was meant to imitate the shape of a female body (Adamczak 2013; see Fig. 20). This is in good correspondence with the cultural phenomenon outlined by Matuschik (2011, pp. 230–4, Abb. 159–61) who claims that a trend of attributing human characteristics to pottery is evident in Central Europe during the Neolithic and Eneolithic periods. Considering the full spectrum of the Baden metalwork over its entire spatial distribution from the TRB-MES III (= 3500–3350 cal BC) onwards, it can be noticed that in the Baden culture complex there was a certain tradition of spiral ornaments. This makes possible to outline the Baden spiral package6 which includes the armbands, like those ones found in the hoards from Bygholm (Denmark) or Rudki and Skarbienice (Poland) (Kowalski et al. 2016, p. 196; Pieczyński 1986), and also the so-called Hakenspiralen and Brillenspiralen (Matuschik 1996). The results of this research indicate that such a package must be now complemented by the Rudki-type double spiral ornaments (= Doppelspiralen). It needs to be emphasised that the Baden spiral metalwork package found an echo in pottery decoration. 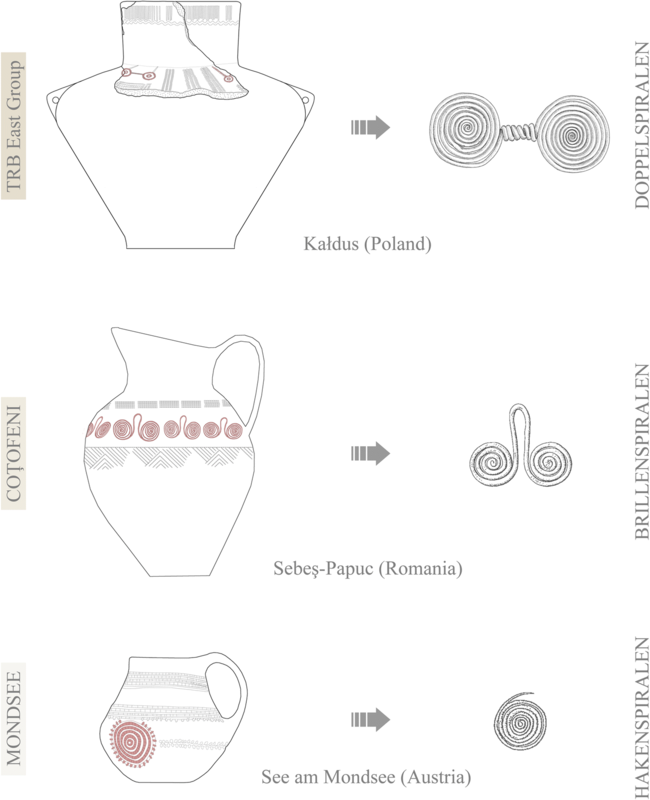 The evidence comes from the images incised on the ceramic vessels recovered from Kałdus (= Doppelspiralen; the TRB East Group), Sebeş-Papuc (= Brillenspiralen; Coţofeni culture) and See am Mondsee (= Hakenspiralen; Mondsee culture) (Ciugudean 2000, p. 267, Pl. 141; Matuschik 1996, pp. 9, 12–3, Abb. 3–6; Mayer 1977, Taf. 115 and 116; Popa 2013, pp. 98, 103, Pl. 2 and 7; Roman 1976, p. 143, Pl. 43; Fig. 21). The Secondary Products Revolution, a model proposed by Sherratt (1981, 1983, 1986, 2006), can be used to illustrate how the TRB communities from the region of modern Poland entered the Baden complex orbit. The mechanism and dynamics of the cultural processes leading to the closer cooperation and integration between the TRB communities and the Baden culture milieu were most probably generated by the strong demand for metal goods by the communities from the North European Plain. Indeed, the archaeological data confirm that the emergence of the Baden cultural package over almost the entire TRB ecumene is contemporary with a remarkable consumption of arsenical copper (Adamczak et al. 2015a, p. 215; Garbacz-Klempka et al. 2015; Kienlin 2014, p. 453; Novotná 1977, p. 628). Contrary to confusing opinions expressed recently about the scale (Nowak 2017, p. 155) or culture-based creativity of the copper metalwork (Przybył 2017), the dynamics of this process appear quite significant. Good examples of these processes are represented by the Bytyń-type flat axes and the copper daggers found in Poland that are reflecting a stable supply of metal to the territory occupied by the TRB (Adamczak et al. 2015a, 2017; see Fig. 18). The wealth of the copper metalwork hoarded in Bytyń, Kietrz or Rudki strongly supports Sherratt’s model. One widely held belief is that the process of expanding the Baden cultural patterns to the TRB milieu was accompanied by the introduction of wheeled transport (Przybył 2015, p. 484, Fig. 9; 2017, Fig. 30A). The evidence comes from the wagon images which were incised on the ceramic vessels from Bronocice, Dopiewo and Kałdus. The radiocarbon dating results make it possible to conclude that the very first indications of such an integration appeared about 3650 cal BC, but it was already at the beginning of 3500 cal BC when this process started to accelerate (c.f. Sochacki 1981). It is essential to mention that together with the introduction of the Baden metalwork package by the TRB communities in Poland, some foreign religious practices were also absorbed including a new funeral rite allowing cremation of the deceased (recently confirmed also in Kałdus) (Adamczak et al. 2015a, p. 215; Przybył 2015, 2017). Apparently, the inflow of the copper metalwork to the northern peripheries of the Eneolithic Europe was more than merely an entry of metal, but it could also have been a catalyst facilitating the introduction of some new cultural elements to the TRB communities inhabiting the region of modern Poland and leading to the important changes in their identities. 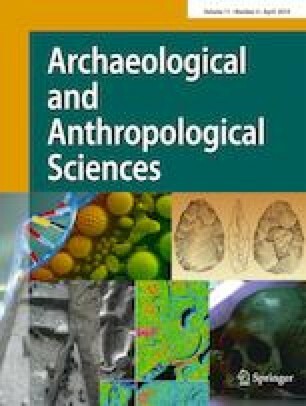 We believe that the results presented here contribute to the breakdown of the stereotypes about the consumption pattern of the copper metalwork during the mid-4th millennium BC in this region and thus stimulate further research and discussion. Further proof for rejecting the copper ore deposits in Cyprus, Southern Spain and Massif Central in southern France as a possible origin for copper metal used for making the DSO from Poland comes from a general archaeological overview of the exchange network in the Eneolithic Europe. There is currently no conclusive archaeological evidence supporting any forms of cultural contact between the Eneolithic communities from Cyprus and Southern Spain with the dominium of the Baden culture complex (see, e.g. Furholt 2009; Sochacki 1981). The beginnings of copper mining in Central Slovakia are placed in the Ludanice group (= TRB-MES I; 4100–3800 cal BC) in Slovenskè Pravno and the Špania Dolina mine located 35 km east of this site and several late Eneolithic settlements from the Zvolen basin (Modarressi-Tehrani and Garner 2015, p. 46; Müller 2012, p. 54, Abb. 8; Müller et al. 2012; O’Brien 2015, pp. 186–7; Schreiner et al. 2012, p. 357; Točik and Žebrak 1989; p. 72; Žebrák 1995, pp. 14–5). The results of our study provide another indirect proof for the copper mining at the Slovak Ore Mountains (Špania Dolina–Banská Bystrica–Kremnica mine complex) during the Boleráz period (= TRB-MES III; 3500–3350 cal BC). So far, there is no conclusive evidence that could support mastering the soldering technique (e.g. 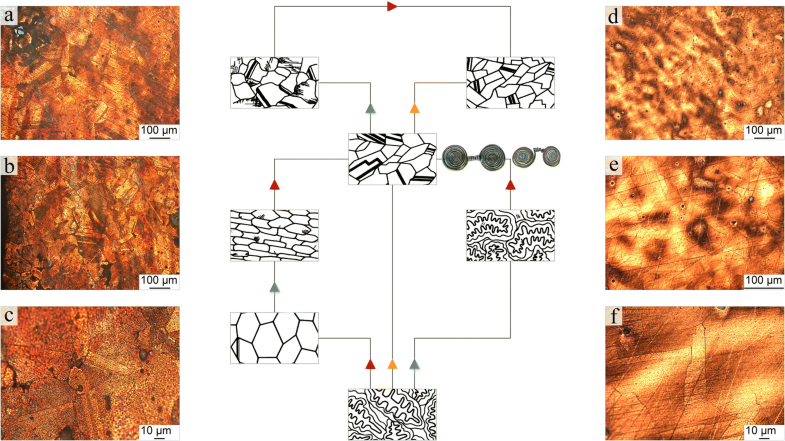 brazing alloy) by the Eneolithic metalworkers from Central Europe. The R_Combine procedure is routinely applied for the radiocarbon dates collected from the same material or stratigraphic context (see, e.g. Bronk Ramsey 2009, 2017). The recent studies in both Northern and Central Slovakia (Horváthová and Zastawny 2016, Obr. 2; Struhár et al. 2015, p. 294, Fig. 7, Table 1; Zastawny and Horváthová 2017, p. 250, Ryc. 1) have confirmed the settlement activity of the communities sharing the Proto- and Boleráz tradition (= 3650–3350 cal BC). The Baden spiral package also includes more fragile jewellery, commonly known as the salta leone (see, e.g. Pieczyński 1986). We thank the anonymous reviewers for their careful reading of our manuscript and their many insightful comments and suggestions. This research did not receive any specific grant from funding agencies in the public, commercial, or not-for-profit sectors.